These tiny little black or white seeds which look a lot like poppy seeds, are great to add to your diet because they contain omega-3 fatty acids (a type of fatty acid that we need to get from food), fibre (great for a healthy digestive tract), protein (necessary for building muscles and aids with feelings of satiety), magnesium (linked to a positive effect on migraines, blood pressure, osteoporosis and PMS) and calcium (vital for strong bones). Did you know? 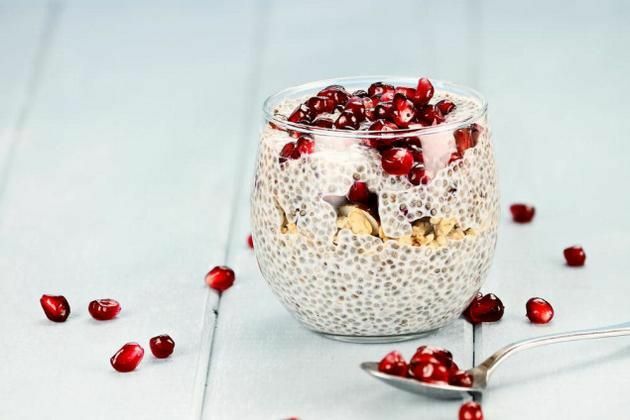 Chia seeds can act as a wonderful binding and thickening agent, making them an ideal replacement for eggs in some recipes and are perfect for healthy desserts that need to set in the fridge. For a “milky” dessert base, soak chia seeds in almond milk and allow to set for 30 minutes in the fridge – remove and top with anything from berries to pear slices to raw cacao nibs to a mixture of toasted nuts and honey.